U.S stock futures are pointing to a higher open Friday after a solid, but not spectacular, jobs report for March. The government reported that 192,000 were added last month. The unemployment rate held steady at 6.7%. 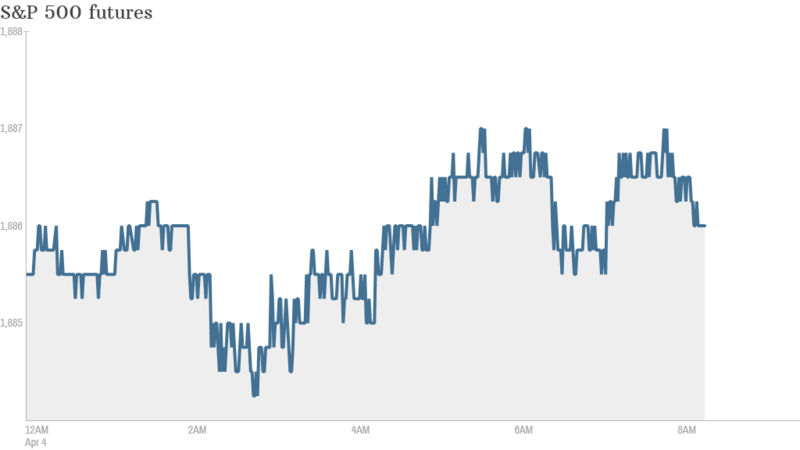 Economists surveyed by CNNMoney had expect payrolls to grow by 213,000 jobs last month. The report could influence the pace at which the Federal Reserve continues to withdraw its support for the economy. Fed Chair Janet Yellen said this week that the jobs market was far from healthy. U.S. stocks closed mostly flat Thursday after the Dow and S&P 500 hit record highs earlier in the day. The Nasdaq fell almost 1%. One stock to watch today is GrubHub. (GRUB) The online food ordering company priced its initial public offering at a higher than expected $26 a share. CarMax (KMX) shares are falling in premarket trading. The biggest seller of used cars in the U.S. reporting weaker than expected earnings largely due to what the company referred to as an accounting correction. European markets were firmer in morning trading. Asian markets ended the week mixed. China's benchmark Shanghai Composite rose 0.7%, while stocks in Singapore dropped 0.3%. The Nikkei was little changed at close of trading on Friday.